If it were that easy, I might have to resort to cannibalism. 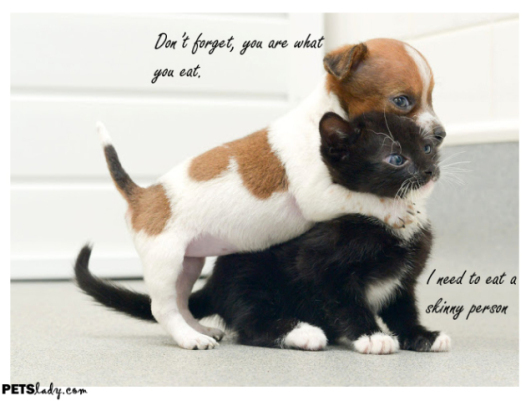 PetsLady's Pet Candy of the Day features these adorable and unlikely pair of cat and dog buddies and the quote: "Don't forget, you are what you eat", "I need to eat a skinny person". We hope this gives you some fitness motivation for your day. Think you can come up with a better caption? Try it out in the comments below! (Original source not found. Please contact us so that we can link to you if you own the original image).